Well in this post i am going to teach u all how to trace the email address.This is the question most people ask if they know when they receive an email from an unknown direction. This tracking or follow-up email can be done using e-tracking tools. Email Tracer is a tool to track the sender email address. It analyzes the email header and gives full details of the sender IP address, which is the key to find the culprit and the route taken by mail, mail server, details of provider services, etc. 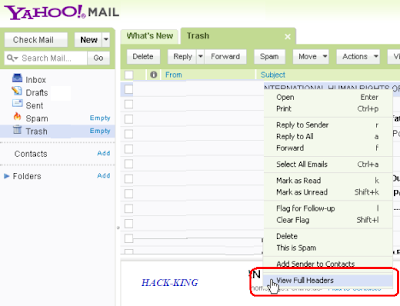 Before starting lets know what is an email header? E-mail header is small piece of information that go with every email and provide information about the sender, recipient, date, subject, email type, etc. The path used to plot the orbit of email and the sender’s location . 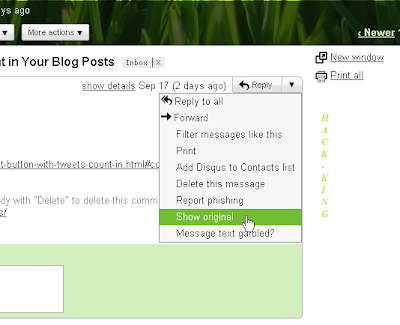 You will see a popup window containing the full header of the email. 2. Copy all text in the email header. You will be redirected to a new page where all the details, including the location of the sender, IP, ISP and the details shown. A new window containing the full header of the email will open.